NOTE: ALL OF THESE PRINTS WERE MADE INTO “THE BIG PRINT” IN THE FALL OF 2010. GO HERE TO SEE THIS IMPORTANT PROJECT. 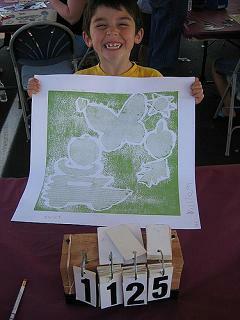 A bunch of kids made wonderful prints in the summer of 2008 as you can see by the photos of all the smiles. 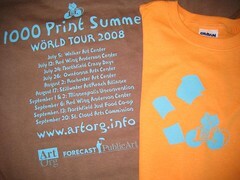 The final 2008 Thousand Print Summer total was 1180 prints! 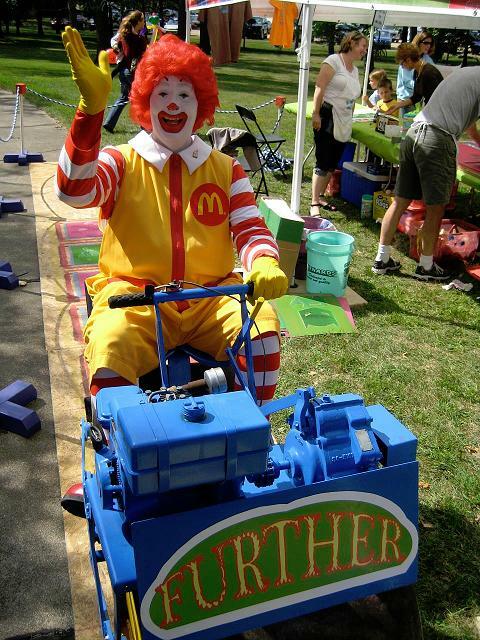 Thanks go to our sponsors, volunteers and the organizations who helped us at each venue. Click on the schedule on the right, because we have a page devoted to each venue’s event, and there you can get access to individual photosets from each event. We heartily thank Forecast Public Art for making this all happen–the grant we received was to purchase the tools and implements to hold this event on an ongoing basis. The printmaking supply company Graphic Chemical and Ink also helped us with the supplies. Thanks! 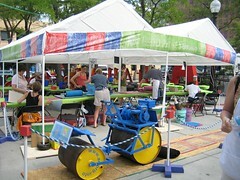 The people who made prints left the events with a beautiful, original steamroller print of their own design on paper. The inky printing blocks are retained by ArtOrg and were collected over the course of the 1000 Print Summer project. After all project venues have been visited in this first stage of the project, we will use the 1000+ printed blocks and reprint them into a huge quilt. This large work will be made by ArtOrg and will incorporate every one of the 1000+ printing blocks created over the summer. The quilt’s projected size is about 80 feet wide by 50 feet tall. 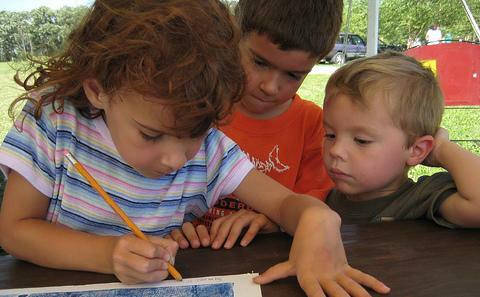 Check back to see when and where this huge collaborative work will be displayed. 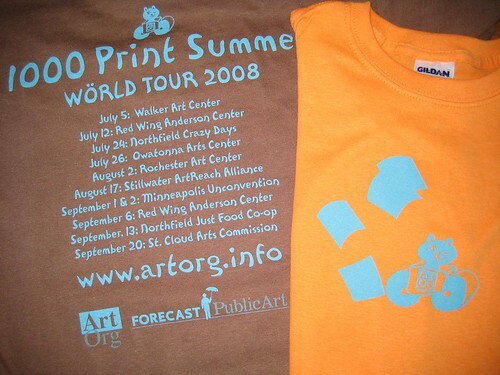 We also offer the exclusive “2008 ArtOrg 1000 Print Summer” tour t-shirt at each of our printing venues, but we have also established a shop where you can order t-shirts online. These shirts are a bit different, because they are printed in multiple colors, and on many different types of shirts (t-shirt colors, baseball shirts, etc.). Please follow this link to go to that store.